3 stone diamond earrings, created in a trilogy cluster design with three equally sized round brilliant cut diamonds. Each diamond is meticulously matched for perfection, styled into claw settings in an original three stone cluster design and beautifully presented and gift boxed for your special moment. 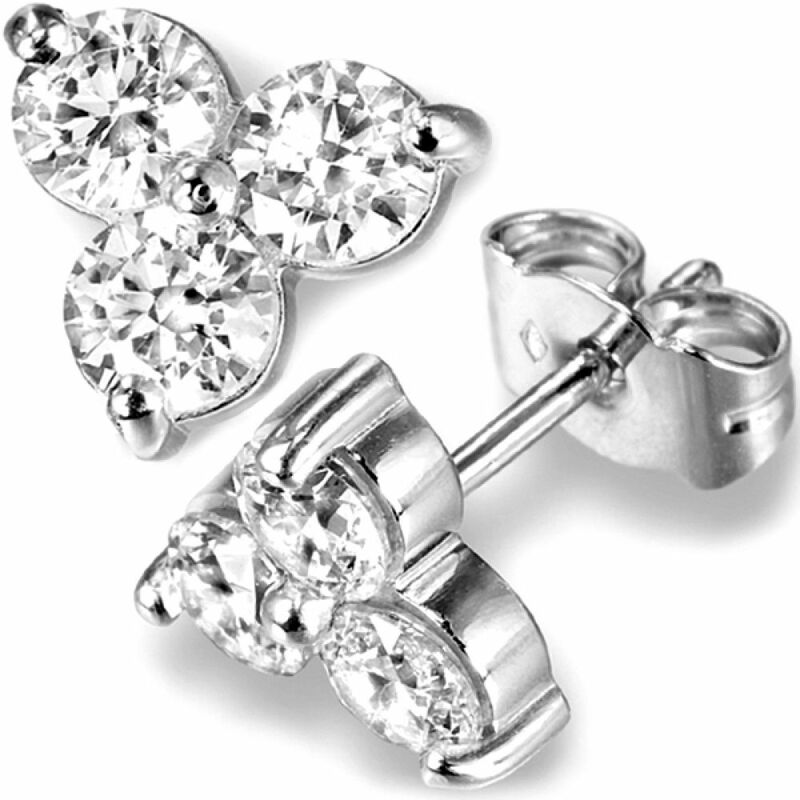 For anyone considering 3 Diamond earrings, the Trilogy 3 stone Diamond earring design makes a perfect choice. Styled in a timeless three-stone stud design, with a cluster effect, this pair of dazzling earrings sparkle with Diamond perfection. We match a total of six Round Brilliant-cut Diamonds, by size, whiteness and clarity to create the perfect earring pair. Choose your total carat weight for the pair of earrings from our drop-down selector. Our entry size holds 6 x 2mm round Diamonds, with options increasing in size to suit your preference. Our premium choice — 2 carat Diamond Trilogy earrings include a total of 6 x GIA certified Diamonds with your purchase for total reassurance. All other options include a full detailed valuation for insurance. This charming pair of 3 Diamond earrings take approximately 3-4 weeks to craft. Each Diamond is claw set, with a single shared claw at the centre. Precious metal choices include 18ct White Gold, 18ct Yellow Gold, 18ct Rose Gold and 950 Platinum. Choose 18ct Fairtrade Gold for 100% ethical standards and full traceability of your gold back to the mine. Your earrings will include push-on butterfly attachments, with two further pairs of secure Lox earring backs for everyday wear and peace of mind. Presented in delightful packaging, each pair of earrings include a Serendipity Diamonds earring box and insured delivery by secure courier to your door. Please contact us for additional help and advice on any of the Diamond earrings within the Serendipity Diamonds collection. Our US clients benefit from fully insured FedEx delivery taking around 1-2 days following completion of your commission. All diamond earrings are beautifully presented in luxury packaging. Our gloss white wooden earring boxes perfectly present your earrings ready for wear. Enjoy the reassurance of 2 pairs of Lox secure earring backs with every purchase. Most of our certified diamonds are typically GIA certified. We adhere strictly to a very good cut grade and all earrings are matched by trained gemologists, ensuring the perfect pair of earrings with the maximum amount of brilliance. All diamonds arrive with assurances of their conflict-free origin and we are now able to provide by request, 100% traceable CanadaMark GIA certified diamonds for many of our diamond color and clarity grades for diamond earrings and jewelry.